It took Claude Shannon about a decade to fully formulate his seminal theory of information. This wasn’t his only big contribution, though. As a student at MIT, at the humble age of 21, he published a thesis that many consider possibly the most important master’s thesis of the century. His problems were different from many of the problems we are likely to deal with, but the template and its reasoning can be generalized to some degree, and when it is, it may just help us think sharper, too. This is where Shannon did the opposite. In fact, as his biographers note in A Mind at Play, he did this to the point that some contemporary mathematicians thought that he wasn’t as rigorous as he could be in the steps he was taking to build a coherent picture. They, naturally, wanted the details. In a speech given at Bell Labs in 1952 to his contemporaries, Shannon dived into how he primes his mind to think creatively when addressing things that are keeping him occupied. Beyond simplifying and looking for the core, he suggests something else — something that may not seem to make a difference on the surface but is crucial for thinking differently. Much of life — whether it’s in your work, or in your relationships, or as it relates to your well-being — comes down to identifying and attacking a problem so that you can move past it. Professor Reg Revans explains the philosophy, origins and applications of Action Learning in archive footage from 1984. Over the years, the theory and practice of Action Learning has developed – this film provides a clear statement of where it all began. (DVD running time: 18 mins 50 secs. PAL and NTSC formats available). Excerpt from a film by Joanna Kozubska, available as a DVD from IFAL (International Foundation for Action Learning). Visit www.ifal.org.uk “Resources’ to download an order form. The battle over the spatial extensiveness of mind has pretty much been won in recent debates in cognitive science. Here we argue that the next step is to defend the temporal extensiveness of mind! What’s involved in developing human capacity to address complexity, taking a mid- to longer-term viewpoint than is usual? How can we create the conditions in which people can cope with the daily challenges of living in a complex world and flourish? What form of leadership is required to inspire and catalyse this transformation? The need for systems thinking is often referred to, but rarely considered, as a rich and comprehensive resource which could be developed further and applied. 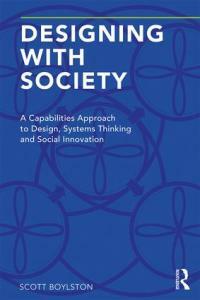 A critical systems thinking approach suggests that a variety of approaches should be drawn upon, in a manner of methodological pluralism, being aware of the strengths and weaknesses of different approaches and applying them adaptively using synthesis as well as analysis.